"In a world in which we daily provide information to a whole host of companies and organisations and willingly carry a variety of cards to identify us, I don’t think the civil liberties argument carries much weight." He also rejects the idea that the scheme cannot be delivered practically by a government machine that has a terrible record in delivering IT projects and points to the success of the Passport Service database. Pointing to the ways in which many other nations are using biometric technologies Tony Blair argues that ID cards will play a role in tackling illegal immigration, crime, terrorism and identity fraud. An analysis on UK Polling Report shows declining public support for ID cards – especially when their costs are highlighted. Most British people appear to have few ‘in principle’ civil liberty concerns about ID cards if they could be sure that they would work (which they increasingly doubt). 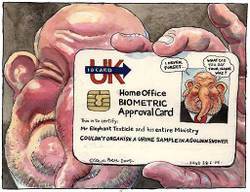 The Conservative Party has promised to make abolition of ID cards an issue at the next General Election and that the huge spending on the scheme could better be diverted to improved border controls and neighbourhood policing. Labour will be gambling that by the time of the next election the practical problems will be under control and the advertised advantages in fighting fraud, immigration and terrorism will make ID cards a vote winning issue. Related link: Alex Deane notes David Cameron’s role in launching Britain’s CCTV revolution.